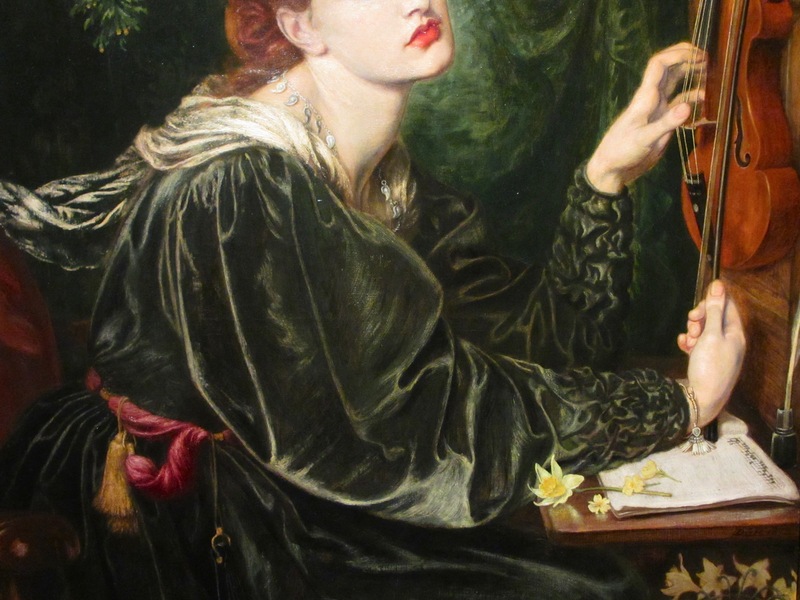 It is difficult to find substantial collections of Pre-Raphaelite art outside the UK. 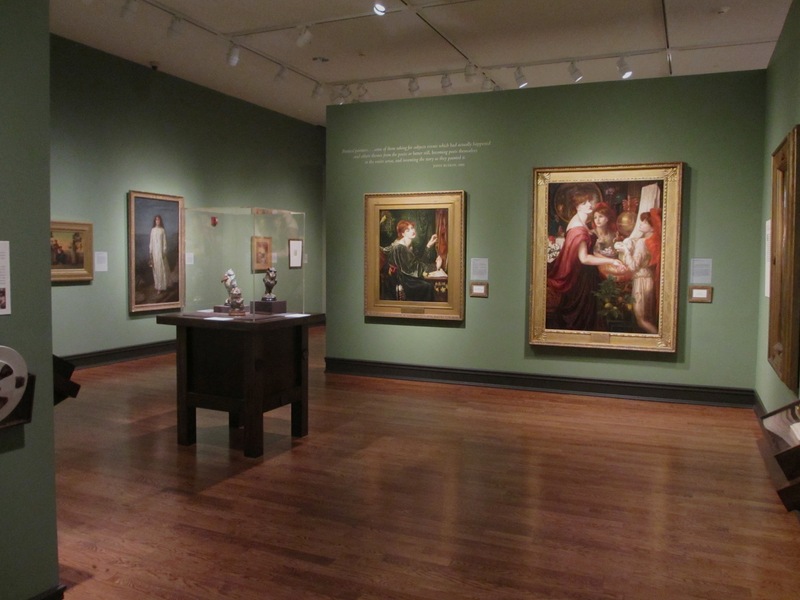 The largest is at the Delaware Art Museum, which I’ve had the pleasure of visiting, and I’d long been aware that the Fogg Museum at Harvard University also has a brilliant collection of works by Rossetti, Burne-Jones and Hunt. When I first visited Boston, last August, the Fogg was at the very end of its six-year, multi-million dollar redevelopment and so was closed — but last month I was able to return to Cambridge, MA, and finally see it for myself. Level 2, Room 2130 of the Fogg. 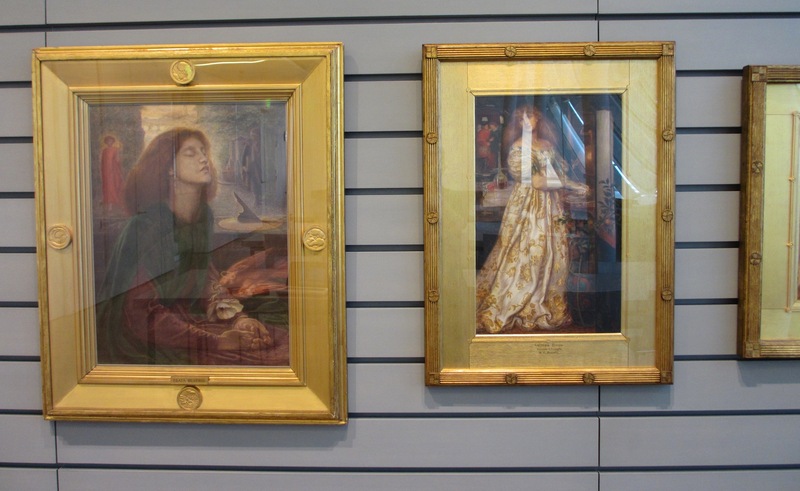 From left to right: Dante Gabriel Rossetti, ‘The Blessed Damozel’ and ‘A Sea-Spell’; Edward Burne-Jones, ‘Day’ and ‘Night’. Level 2, Room 2130 of the Fogg. 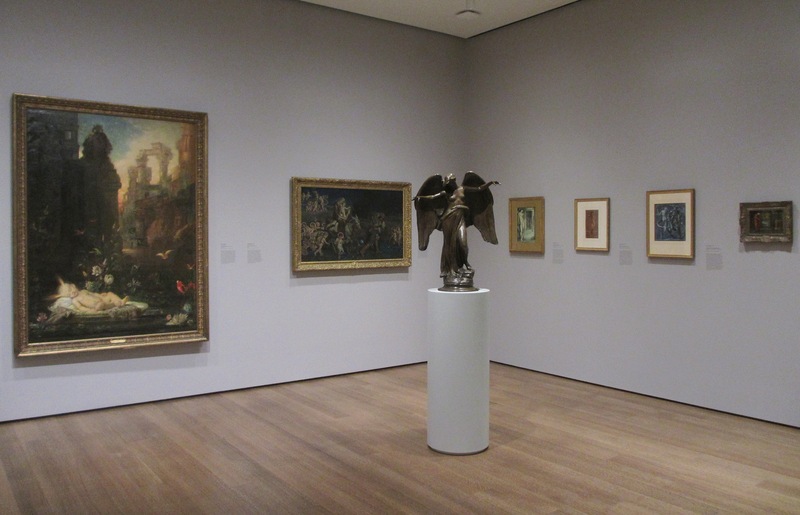 Left to right: Gustave Moreau, ‘The Infant Moses’; William Holman Hunt, ‘The Triumph of the Innocents’; Daniel Chester French, ‘Spirit of the Waters’; Edward Burne-Jones, ‘Venus Epithalamia’, ‘Helen of Troy’, ‘Perseus and Andromeda’ and ‘Danaë watching the building of the Brazen Tower’. 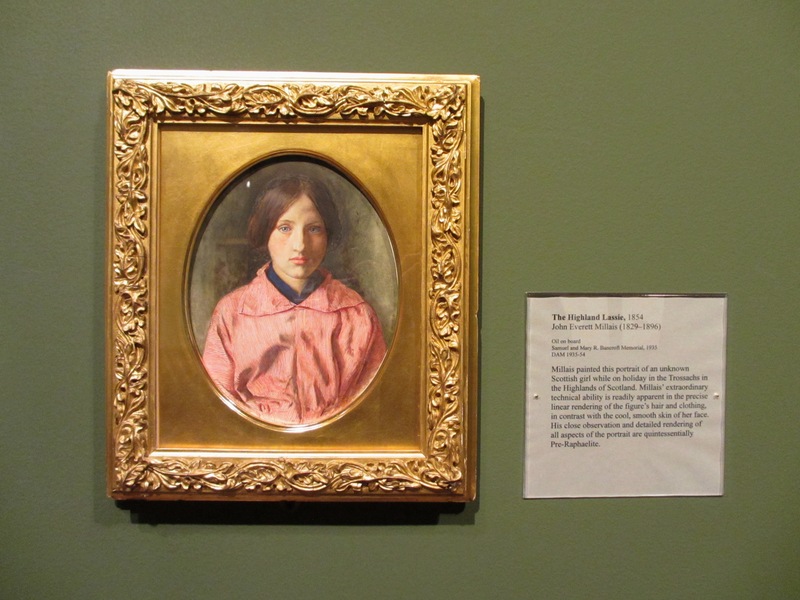 The above photos give an impression of the museum’s light, uncluttered galleries, and also of the large proportions of Rossetti’s masterwork The Blessed Damozel, of which the Fogg version of 1871-8 is the original (below). 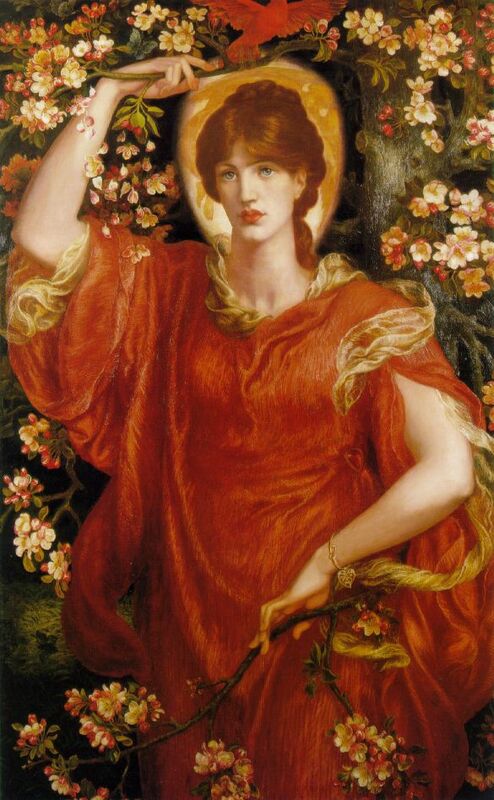 One of the few paintings Rossetti based on one of his own poems (he usually worked the other way round), it is a synthesis of his favourite themes: love, death, female beauty, ‘floral adjuncts’, a kind of sensual, even pagan spirituality. The aforementioned poem, also titled ‘The Blessed Damozel’, was one of his earliest — the first draft dates from 1847 — and was particularly inspired by Edgar Allan Poe’s ‘The Raven’ in its exploration of a beautiful heavenly lady mourned by her earthly lover. The latter occupies the narrow predella below, reclining in a shadowy grove; the predella format, a common feature in medieval and Italian Renaissance altarpieces, heightens the viewer’s sense of participating in the worship or veneration of beauty. 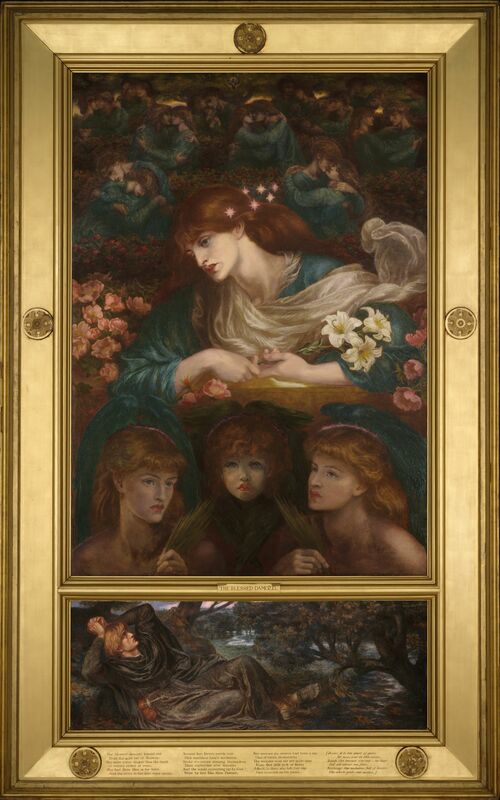 Certain details of Rossetti’s literary work — those featured in the stanzas inscribed along the bottom of the frame he designed himself (below) — correspond with the painting, such as the three lilies held by the Damozel, the (almost) seven stars haloing her head, and the ‘newly met’ lovers embracing around her in Paradise. 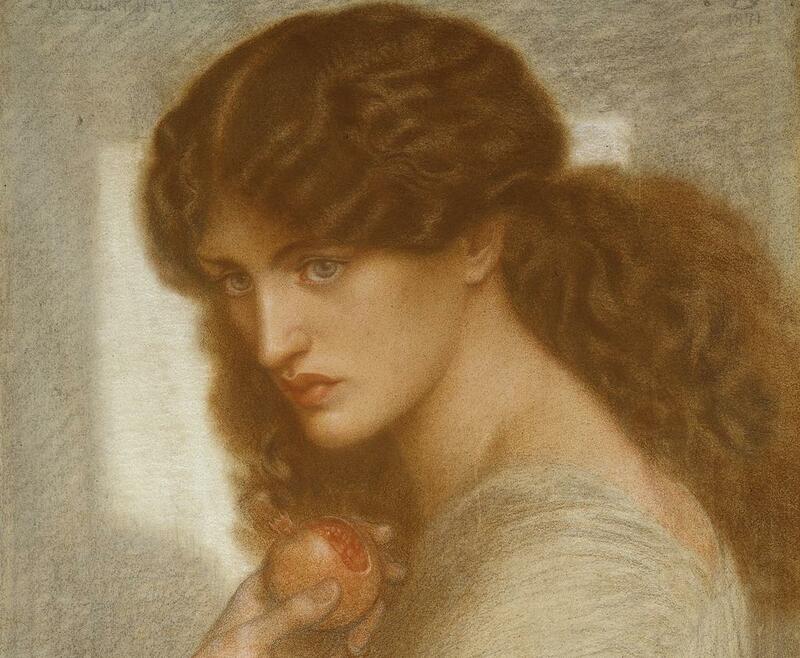 An especially striking feature of the picture is its thick, fluid brushwork, characteristic of Rossetti’s ‘Venetian’-inspired style from the 1860s onward, and a glistening quality to the paint presumably caused by the glazing. 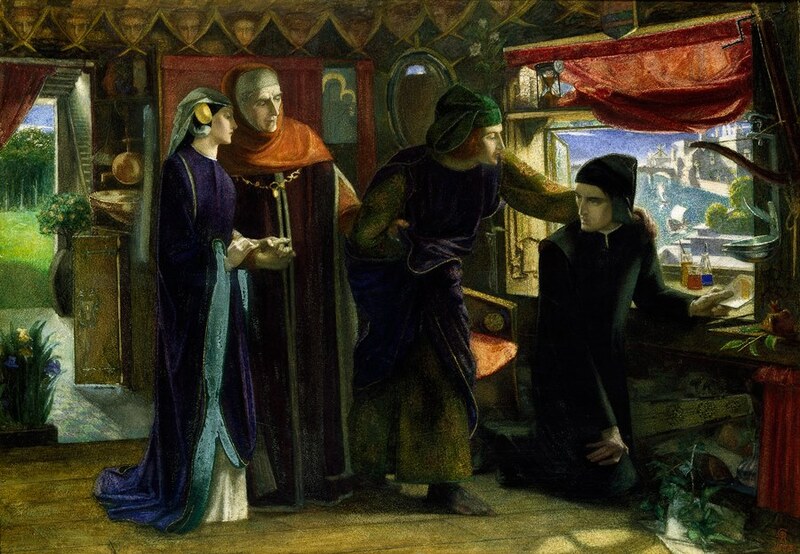 Dante Gabriel Rossetti, ‘The Blessed Damozel’, 1871-8. Oil on canvas, 212.1 x 133 x 8.9 cm (framed). Source: Harvard Art Museums. The earthly lover in the ‘Blessed Damozel’ predella. 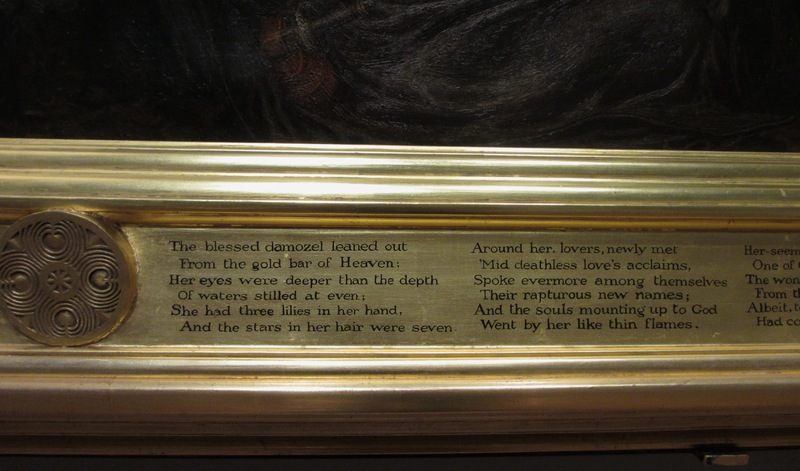 Poem by Rossetti, ‘The Blessed Damozel’, inscribed on the lower frame. Her lips move and she soars into her song. In both poem and painting the siren is trapped in an endless cycle of becoming mesmerised by her own song. Her tensed hands and wistful expression (modelled, like The Blessed Damozel, by Alexa Wilding) betray a sadness and ennui, while her lavish tresses of coppery hair, entangled in the branch above her head, further entrap her and indicate the passage of time through their long length. The composition is flat, claustrophobic and airless despite the outdoor setting, with only a hint of the sea between the leaves on the far left — in fact, without this small section of water, the seagull and the accompanying poem, there is no indication that the lady’s bower is by the ocean. Dante Gabriel Rossetti, ‘A Sea-Spell’, 1875-7. Oil on canvas, 111.5 x 93 cm (unframed). Source: Harvard Art Museums. Two rich, impressive paintings by Hunt are also on show on the second floor: a version of The Triumph of the Innocents (below), and The Miracle of the Holy Fire, Church of the Holy Sepulchre. While both works are deeply religious, they each express a different facet of Hunt’s artistic programme. The Triumph vividly depicts the supernatural moment from the New Testament when the souls of the infants slain during the Massacre of the Innocents frolic jubilantly round the Holy Family fleeing Bethlehem (an event commonly referred to as the Flight into Egypt). 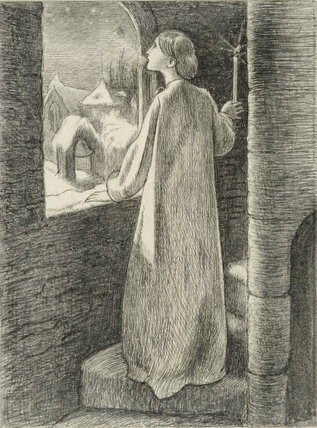 With its visionary atmosphere, and being essentially an imagined scene, it is in the same vein as Hunt’s The Light of the World. 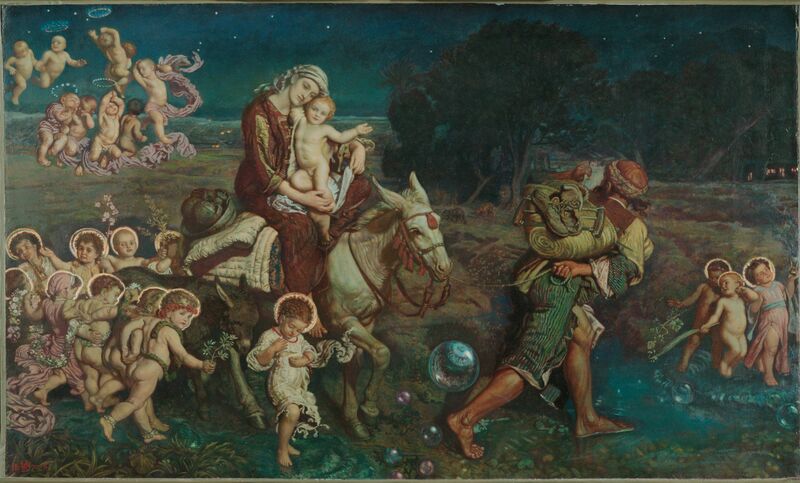 William Holman Hunt, ‘The Triumph of the Innocents’, 1870-1903. Oil on canvas, 75.3 x 126 cm (unframed). Source: Harvard Art Museums. On the other hand The Miracle of the Holy Fire (below) attempts to record, with a meticulous realism characteristic of the artist, a ceremony which still happens annually on Holy Saturday at Christ’s tomb in the Holy Sepulchre, Jerusalem — as observed by the Greek Orthodoxy. An Orthodox patriarch enters the tomb alone and prays, before emerging with what is believed to be the miraculous Holy Fire which is then disseminated to the gathering of candle-bearing worshippers. Contemporary photographs of the event illustrate how little the scene has changed since Hunt painted it. His composition is so panoramic and lively that the miraculous fire seems secondary to the many other figures and interactions within the crowd. Therefore, any sense of supernaturalism and religious awe evoked by the ceremony must also compete with Hunt’s microscopic interest in real people (each face could be an individual portrait), real lives and historical, anthropological authenticity. However, it could ultimately enforce the idea that without human belief, human worship and human interaction, miracles such as the Holy Fire could never take place — a meeting-point between man and the divine. 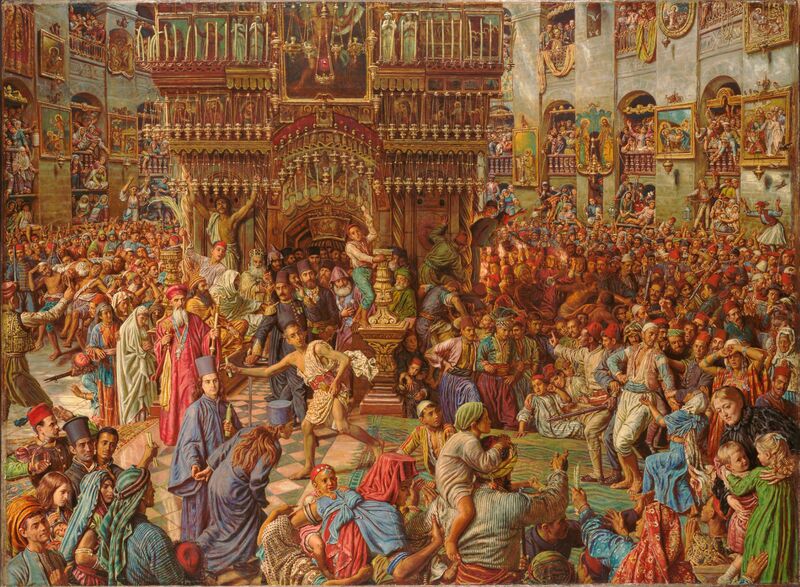 William Holman Hunt, ‘The Miracle of the Sacred Fire, Church of the Holy Sepulchre’, 1892-9. Oil and resin on canvas, 92.1 x 125.7 cm (unframed). Source: Harvard Art Museums. Prior to my visit I had asked to see specific works not on public display. This was actually easily done — Harvard Art Museums have made their collection as accessible as possible, allowing anyone (not just Harvard students) to view particular works on request in the new study rooms upstairs (though for practical purposes the really large paintings and sculptures can’t be brought up from storage). 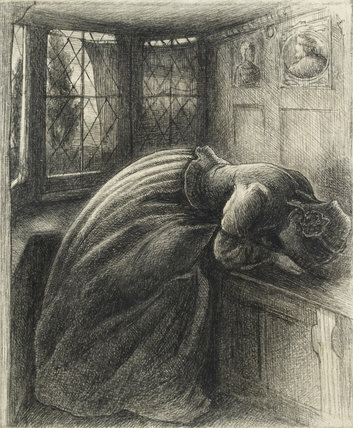 It just so happens that the Fogg holds an impressive number of Rossetti works on paper, which, for my MA dissertation on his watercolours, were fascinating to examine up-close in a well-lit and quiet surrounding. I’d expected the works to be simply mounted in the usual archival fashion — instead, they were hung along the wall in their distinctive original frames. 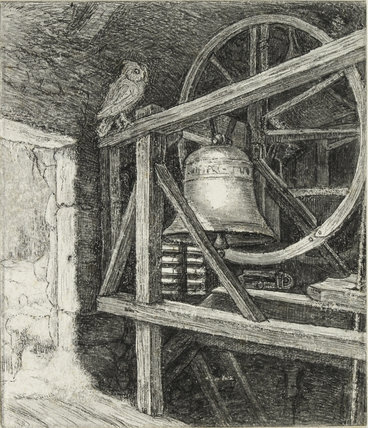 Among them were a large watercolour replica of DGR’s famed Beata Beatrix (the first version, painted in oils from 1864-70, is at Tate Britain), and the watercolour Lucrezia Borgia, a replica of an earlier watercolour of 1860-1 now also in the Tate. 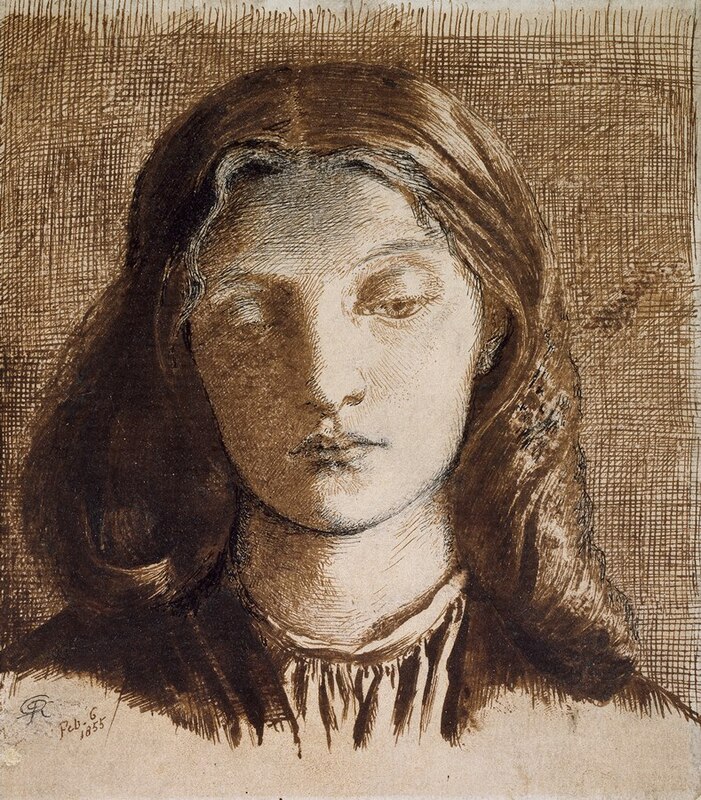 It was encouraging to see one of the driving points of my thesis — that Rossetti continued producing watercolours long into the 1860s and ’70s — so much in evidence, and it would be great to see the Fogg make more of their superb collection in future. 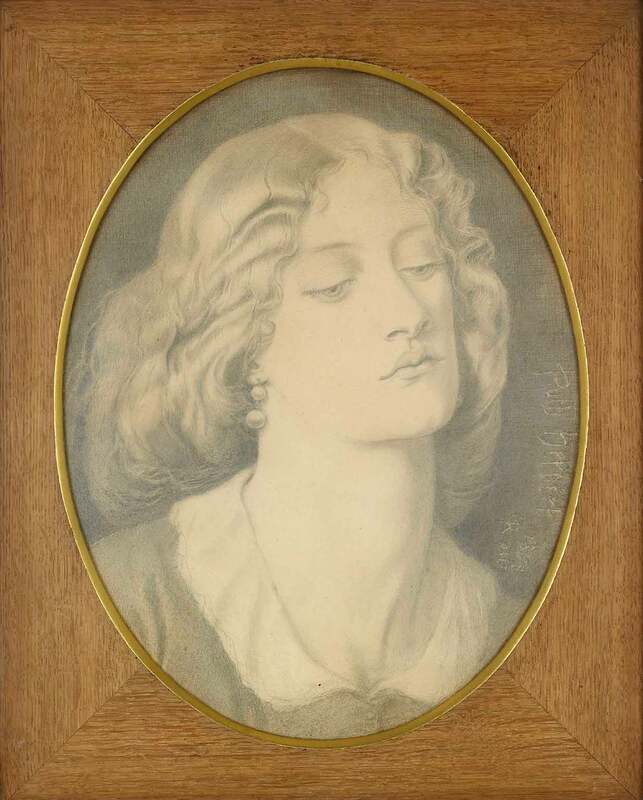 D. G. Rossetti, ‘Beata Beatrix’, 1871, watercolour version (left); ‘Lucrezia Borgia’, 1871. 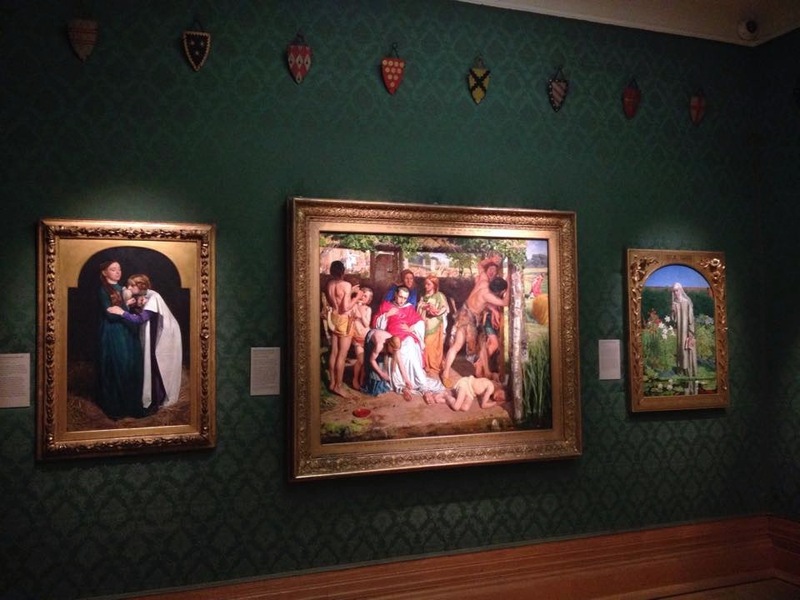 The above works ensure that the Fogg is one of the best places to see Pre-Raphaelite art outside the UK. No P.R.B. 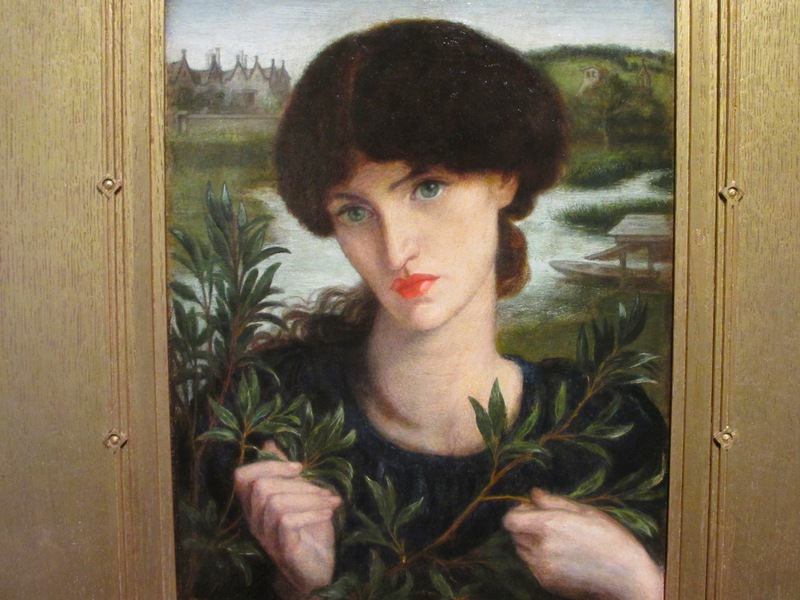 or general Victorian art pilgrimage in Boston is complete without a visit to the Museum of Fine Arts, home to Rossetti’s pivotal painting Bocca Baciata (below), Burne-Jones’s Hope, Leighton’s The Painter’s Honeymoon and William J. Webbe’s charming Rabbit amid Ferns (below); then to the Isabella Stewart Gardner Museum, an enchanting poem of a house containing a Rossetti panel, Love’s Greeting, as well as Whistlers, Sargents and art objects from throughout history. Dante Gabriel Rossetti, ‘Bocca Baciata’, 1859. Oil on panel, 32.1 x 27 cm. Museum of Fine Arts, Boston. 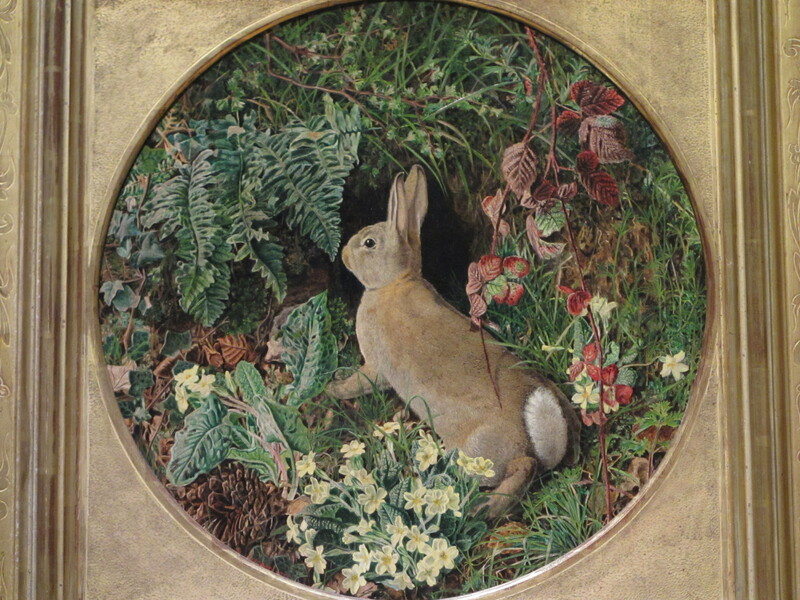 William J. Webbe, ‘Rabbit amid Ferns and Flowering Plants’, 1855. Oil on canvas, 35.6 x 35.6 cm. Museum of Fine Arts, Boston. Alas, I have neglected this blog of mine for several months! University, and probably life in general, has got quite in the way (I’ve a dissertation to write!). But, no fear, I have returned. I was recently in the United States on a family visit, and since Bethesda, MD, is only a two-hour drive from Delaware I slyly encouraged a trip to Wilmington with the intention of going to the Delaware Art Museum. 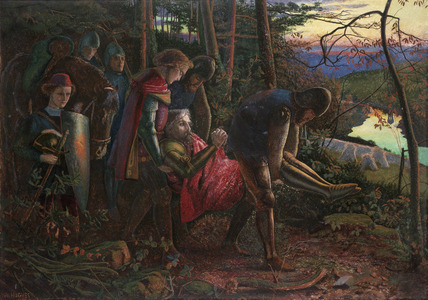 The museum occupies a special place in Pre-Raphaelite studies since it holds the largest and most important collection of the Brotherhood’s work outside the UK, which is certainly unusual for such a deeply British movement. 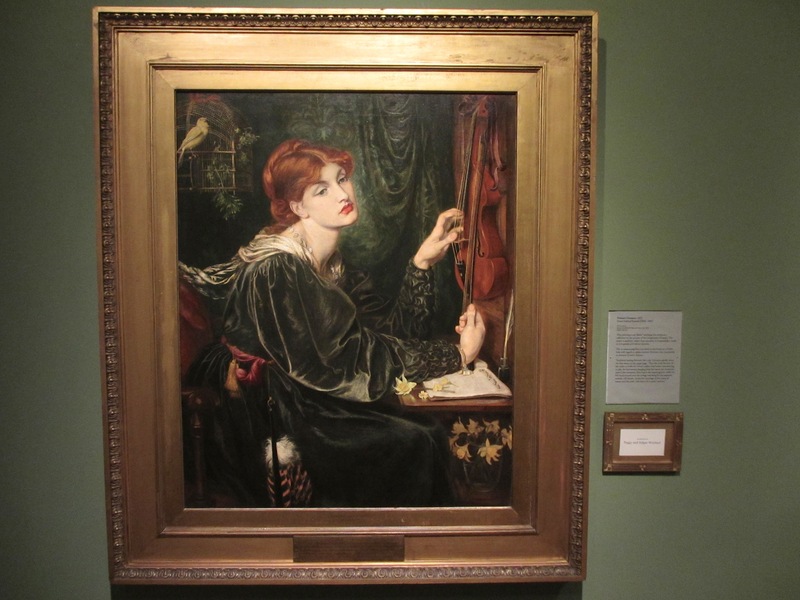 Samuel Bancroft, a Wilmington textile mill owner, first rapturously beheld a Pre-Raphaelite painting — Rossetti’s Vision of Fiametta (1878) — in 1880, and in the 1890s began to enthusiastically acquire PRB art to display in his home, now sadly demolished. His fine collection was bequeathed to the museum in 1935, and although his tastes would surely have seemed bizarre to his fellow Americans at the time his passion for the work of D.G. 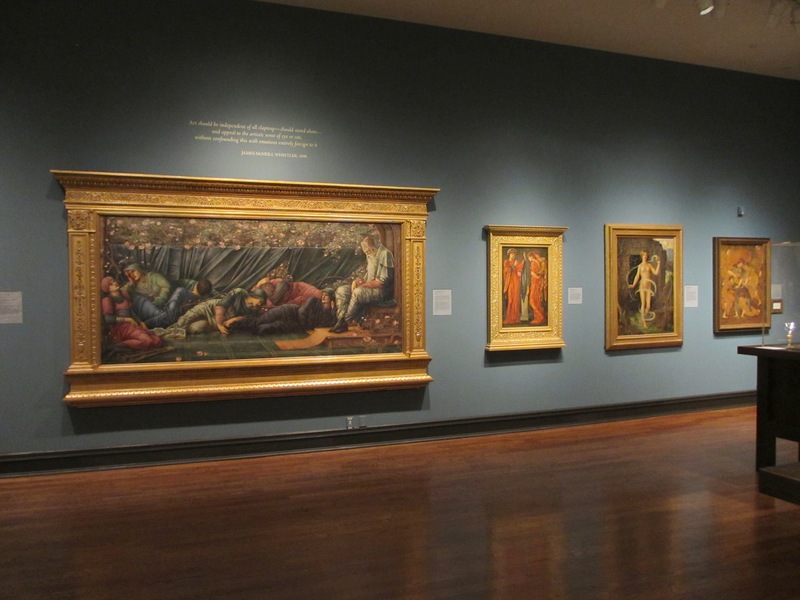 Rossetti, Edward Burne-Jones, John Millais and Ford Madox Brown resulted in one of the few American collections of nineteenth-century British art (I believe that the Fogg Museum at Harvard University is one another). Despite an apocalyptically-titled ‘polar vortex’ we were able to make the journey up to Wilmington, and I spent the afternoon at the museum. I was especially privileged to meet with Margaretta S. Frederick, chief curator of the Bancroft Collection, who very kindly took the time to show my father, my sister and me round the main gallery and then to see a substantial number of paintings in storage. She was very friendly and welcoming, and it is always lovely to speak to a fellow Pre-Raphaelite obsessive (if that’s the right word to use!). I am now tempted to return to the museum and make use of its fabulous library (which includes original volumes of The Yellow Book and Rossetti first editions) for future research! The galleries themselves are beautifully assembled. Some of the walls are papered with William Morris’s Marigold pattern, while others are painted in greens and blues to complement those rich Pre-Raphaelite colours. As you can see from the photographs below the rooms were empty on that cold Wednesday afternoon, so I was able to examine and wander among the paintings and objects in reverential solitude. I had seen some of the pictures in previous exhibitions — Veronica Veronese at the V&A’s Cult of Beauty; Lady Lilith at the Tate Pre-Raphelites — but due to crowded conditions it was difficult to really get close and appreciate them in one’s own time, so this quietude was rather welcomed by me (though it would have been nice to see a few others out Pre-Raph hunting!). 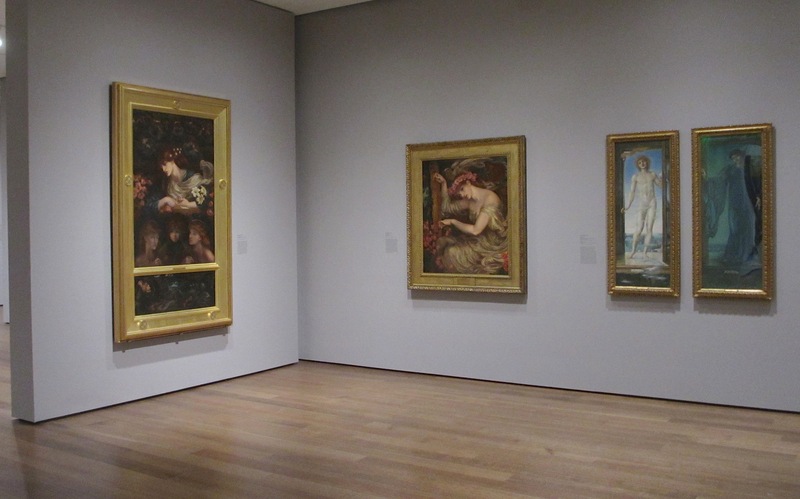 On the wall: ‘Veronica Veronese’ and ‘La Bella Mano’ (bigger than I expected) by Rossetti; ‘The Somnambulist’ by Millais. Photography is allowed, fyi. ‘The Council Chamber’ from the ‘Briar Rose’ series — certainly the largest Burne-Jones I have yet seen! I thought it would be nice to focus on a few favourite works in the collection. 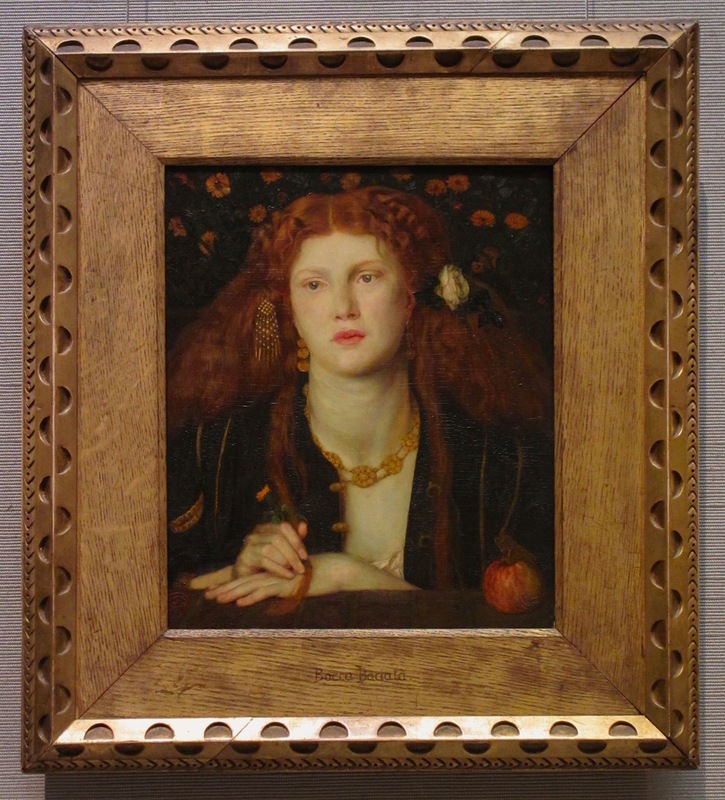 The painting which greets you in the first room (and it was the first Pre-Raphaelite work Bancroft bought) is one I was particularly looking forward to seeing, though its small size makes it seem unassuming and even a little insignificant when compared alongside other, much larger works by Rossetti. Titled Water Willow, it’s a kind of love letter to Jane Morris and was painted at Kelmscott Manor in the summer of 1871. Anyone who read my previous post about William Morris’s bed might have some idea of my deep love for Kelmscott, and Water Willow actually features the house and the village church in the background and what is presumably the River Thames with a boathouse in the middle ground. 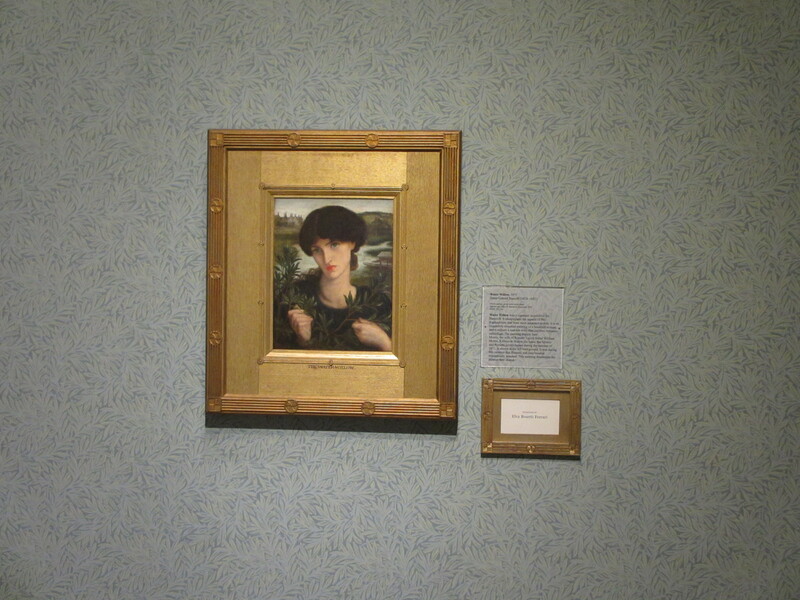 (A copy of the painting executed by Charles Fairfax Murray in 1893 currently hangs in Jane Morris’s bedroom at Kelmscott Manor, which left me eager to see the original!) Rossetti’s infamous affair with Jane reached its peak at this time, and while William was away in Iceland the two used Kelmscott and its surrounding landscape as a private, rural retreat in which to indulge their passions. The painting can also be regarded alongside several sonnets which Rossetti composed in the same summer, now informally called the ‘Kelmscott Love Sonnets’. One such poem, ‘Silent Noon’, is rich with natural imagery and a quiet atmosphere which matches the Water Willow painting (see links at the end). I particularly love the picture’s cool, aqueous colour palette of watery greens and pale blues, echoing Jane’s eyes and imbuing the painting with a curiously introspective, meditative mood. The willow boughs of course also bring to mind one of William Morris’s best-loved designs, though his pattern was first printed a good few years later in 1887. 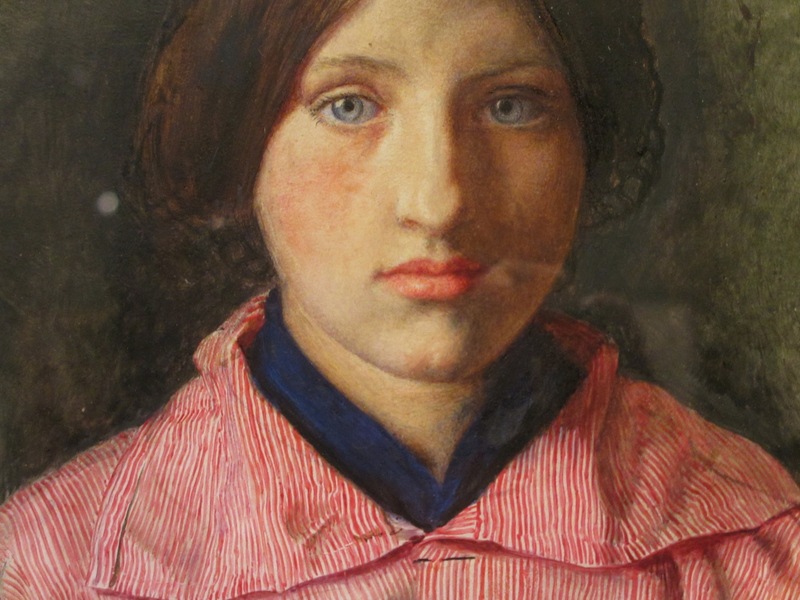 Another lovely painting in the collection is John Millais’s The Highland Lassie from 1854. Also small in size, this painting actually reminded me somewhat of those little oval gold-framed daguerrotype portraits popular in the Victorian period; certainly, Millais’s obsessive attention to detail has been described as photographic and this painting’s plain background is perhaps reminiscent of a backdrop in a photographer’s studio. 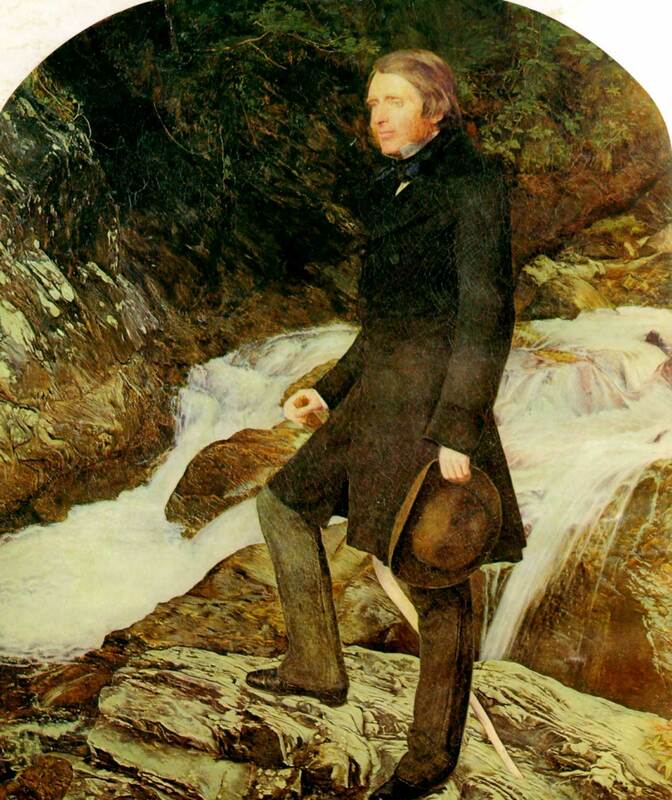 It is one of several paintings executed by Millais in the Scottish Highlands, the most famous of which is his portrait of John Ruskin (recently bought by the Ashmolean), and the sitter’s name is now sadly unknown. She gazes out at the viewer, her blue eyes and the soft pink of her lips and faint blushing cheek complemented by her dark blue collar and the pink and white pinstripes of her dress (though Millais originally requested a dress of Rob Roy tartan). Suddenly leaning forward, the Lady Veronica rapidly wrote the first notes on the virgin page. Then she took the bow of the violin to make her dream reality; but before commencing to play the instrument hanging from her hand, she remained quiet a few moments, listening to the inspiring bird, while her left hand strayed over the strings searching for the supreme melody, still elusive. It was the marriage of the voices of nature and the soul — the dawn of a mystic creation. Echoing Walter Pater’s famous claim in his essay ‘The School of Giorgione’ that ‘All art constantly aspires towards the condition of music’, the painting could thus also be viewed as a representation of the creative process. As a souvenir of my visit I decided to buy a particularly beautiful book about the Bancroft Collection with some gifted dollars. 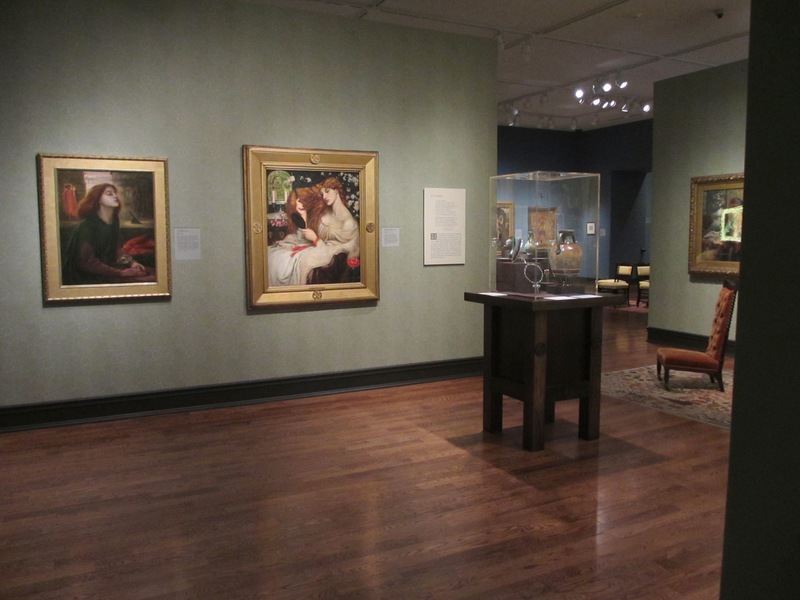 Its full title is Waking Dreams: The Art of the Pre-Raphaelites from the Delaware Art Museum, and almost all of the works on display and in storage are photographed with accompanying commentaries. The only downside is that it made the luggage a good deal heavier on the flight home! I could not recommend the museum highly enough to other Pre-Raphaelite fans, and thanks must be given again to Margaretta Frederick for showing me its unique collection. The Bancroft Collection has its own excellent website which lists all the paintings by each artist, with high-quality photographs. The Delaware Art Museum’s main website, with information of its other collections. Any pirate fans would appreciate its galleries of Howard Pyle! 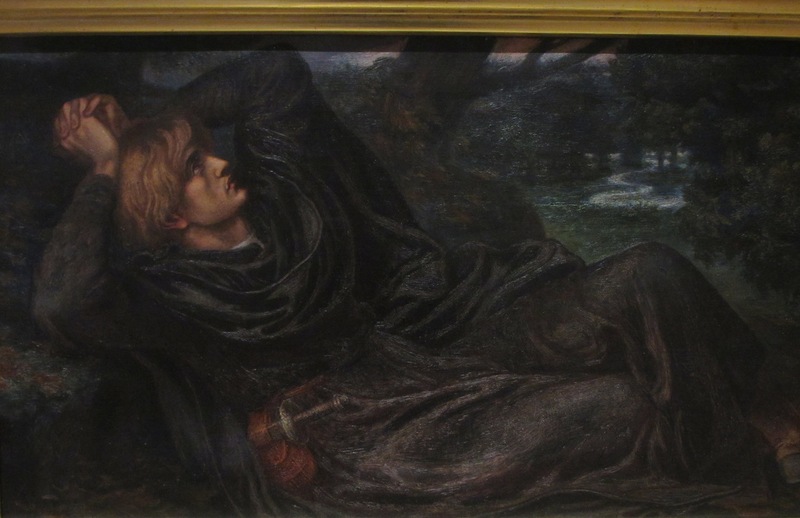 Dante Gabriel Rossetti’s ‘Kelmscott Love Sonnet’, ‘Silent Noon‘, composed like Water Willow in the summer of 1871 at Kelmscott Manor. 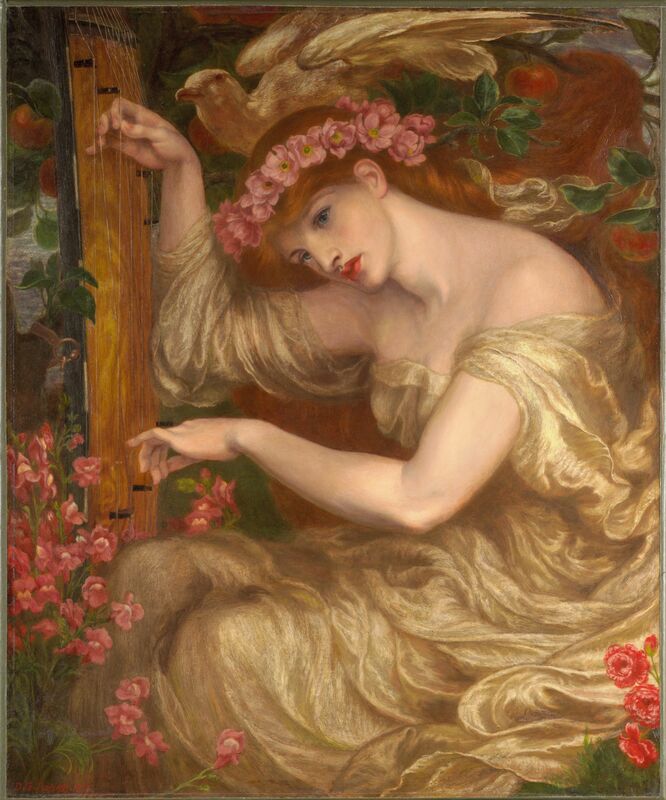 The text here is from The House of Life, Rossetti’s large sonnet sequence published in complete form in 1881. Veronica Veronese in the Rossetti Archive, with a more in-depth discussion of its production and iconography.